My account of the Nazi scorched earth burning of Finnmark and Nord-Troms will be available from October 2014, published by The History Press. 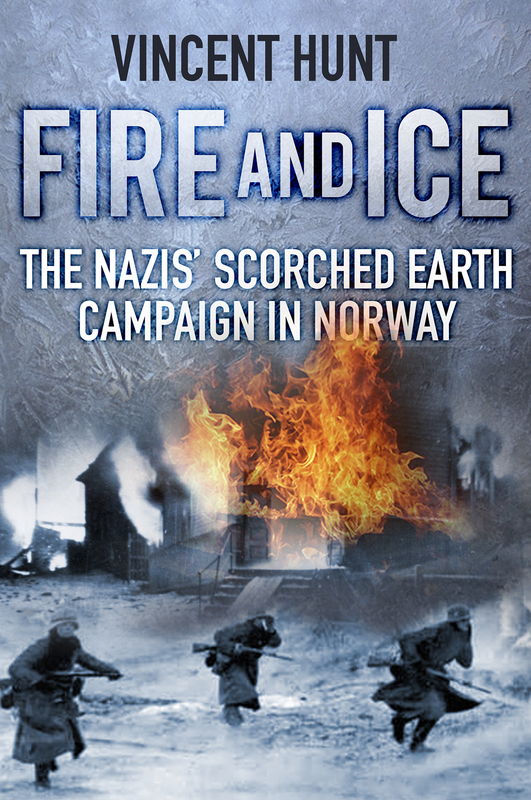 It will be called ‘Fire and Ice: the Nazis’ scorched earth campaign in Norway’ and will be available from all good bookshops and online outlets, priced (in UK) £20. From Kirkenes to Tromsø, my journey across the Arctic north of Norway exploring the wartime scorched earth burning of Finnmark was a story that got darker and darker. The Nazi camps where Soviet prisoners starved to death, sometimes making a last grab for food .. only this was human flesh. The fishermen cut down by German bullets at Hopseidet with the end of the war just hours away .. and the daughter who still cries for her father seven decades later. And the people of Kirkenes whose families were bombed and blasted and still feel today that the rest of Norway doesn’t care what happened to them in the war – maybe doesn’t even know. It’s a collection of Norwegian stories told in English as I travel from the far north east round to Tromsø via Gamvik, Honninsgvåg and Hammerfest – a fascinating journey in places of spectacular natural beauty meeting people with incredible but sometimes tragic tales to tell. Now we’re on the final leg of that journey – the book is going to print in a few days – so I will update this blog as we get ready for the launch. I’m very excited. There are some incredible stories in ‘Fire and Ice’ and I met some lovely people along the way. I certainly hope I will be able to return to Norway for a book launch. Once again I should acknowledge the generosity and support of the Royal Norwegian Embassy in London and the Rica and Radisson Blu hotel groups … and in particular Wideroe, the airline serving those incredibly windswept, remote but wonderful places. My thanks to everyone involved and I hope you enjoy reading the book. This entry was posted in 20th Century, Arctic Circle, coastal guns, Finnmark, Finnmarken, German submarines, Germany, Hammerfest, history, Hitler, Honningsvag, Hopseidet, Housing, Hurtigrute, Nazi, Norway, prisoners of war, Scorched Earth, Second World War, Soviet Union, traumatic story, Uncategorized, Wideroe airlines and tagged andersgrotta, Finnmark, history, history press, hunt, Hurtigruten, Kirkenes, kirkenes scorched earth nazi 1944 tromso, Norway Oslo Kirkenes Hammerfest Wideroe Radisson Blu Rica Nazi scorched earth Daiga Kamerade, polar bear, Rica, snow, snow hotel, vincent, vincent hunt. Bookmark the permalink. Congratulations! Yet another title to add to the to-be-read list. I look forward to reading your book. No doubt it is excellent. Thanks! I hope you’ll enjoy it.